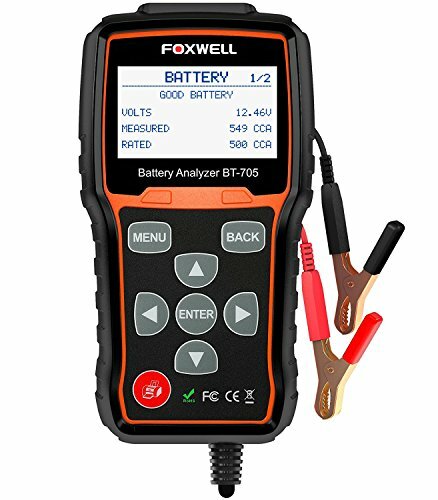 Best Car Battery Tester Foxwell BT705 or Solar BA327 ? Knowing which is the best car battery tester can save you both time, money and headaches. The issue is, there are so many on the market it can be tough to choose the right one. But, just before I get down into the detail, let me put something to you. 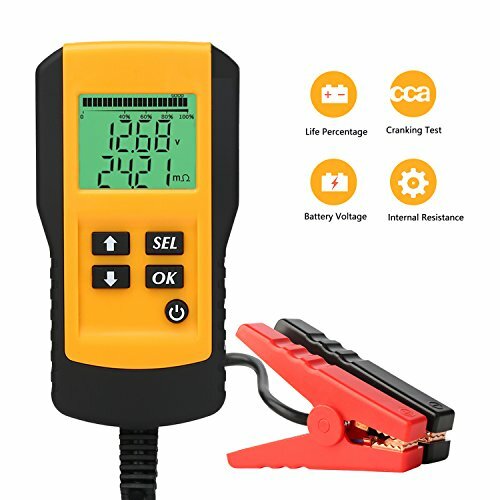 If you’re looking for a tester to test your camera batteries or other household batteries, check out this page the best household battery tester. What Are the Benefits of the Foxwell BT705? What Are the Drawbacks of the Foxwell BT705? What Are the Benefits of the Solar BA327? What Are the Drawbacks of the Solar BA327? What Are the Benefits of theSchumacher BT-100? What Are the Drawbacks of theSchumacher BT-100? What Are the Benefits of theSuner Power AE300? What Are the Drawbacks of theSuner Power AE300? What Are the Benefits of the OTC 3180? What Are the Drawbacks of the OTC 3180? Why Does My Car Have aBattery Anyway? Why Do I Need a Car Battery Tester? If you’ve ever owned a car, at some time or another you will have experienced the dreaded dead battery. You expect your car to fire into life, yet all you hear as you turn the ignition is a “click” sound. That’s it. Not only is this annoying, but it can also ruin your plans and possibly involve a considerable expense. Car battery testers can, in many cases, prevent this occurring. They give you the peace of mind that your car is going to start and can indicate whether the battery is beginning to fail. This article will take you through the best car battery testers available. It will also give you some useful information on the key features you should be looking for. Below are, in my opinion, the best car battery load testers available. They are suitable for everyone, from the technophobe through to the serious motorhead. Coming from the automotive diagnostics specialists, Foxwell, this is a simple-to-use tester that delivers comprehensive results in just over three seconds. A tester designed for 12-volt batteries, it also has the capacity to test the integrity of 24-volt battery charging systems. It’s not quite as long as the Solar tester, but still has extensive 7.8 foot, rubber-coated leads, which should protect against wear and corrosion. These leads culminate in gold-paint alligator clips. With a capacity of 100 through to 2000 cold cranking amps, it’s suitable for larger SUVs and trucks. The CCAs are indicated in increments of one—leading to the most accurate reading, with no rounding up or down. In addition, whatever the battery in your vehicle, this tester will be compatible. A menu system on the backlit LCD display takes you through all stages of the testing process. You don’t have to refer to a manual to decipher the data. The screen indicates whether the battery is good, needs replacing or is losing power, etc. This is a useful feature if you struggle with understanding technical information. The menu is controlled easily, through a flat keyboard. The lack of physically protruding keys means that this unit is completely sealed. Therefore, it is unlikely to be damaged by either water or oil penetration—making it a good choice for outdoor use. Five lines of data allow you to see all the information at once, without switching screens. While this tester has no inbuilt printer, it does have Bluetooth capabilities. Hence, details can be sent to a compatible Bluetooth device for either printing or digital storage. The unit is slightly tapered to allow secure and comfortable handling. It is narrow enough to be gripped in one hand, leaving the other spare for attaching the cables to the terminals. Rubberized edging protects from damage, should the tester slip from your grasp. Fast and efficient—delivering results within three seconds. Water and oil resistant casing and keyboard. Cranking, start-up and load-test capabilities. Bluetooth connectivity for printing and/or storage. Ergonomically designed for safe handling. “Real language” status indication—no need to decipher data. The unit is difficult to place into the included carrying case. Requires an optional Bluetooth printer for physical documentation. A fast tester that delivers all the information you require in a battery test, including cold-start up and load testing. Suitable for the keenest of motor enthusiasts or the small garage business. Sturdy and easy to handle. One of the most comprehensive and accurate battery testers on the market, made by the renowned Solar brand. This tester is suitable for either six volt or 12-volt batteries. Making it suitable for those with a 2018 car model, a classic auto, or a vintage vehicle. If you’re lucky enough to have an absolute beast of a machine in your driveway, then you will not be disappointed. 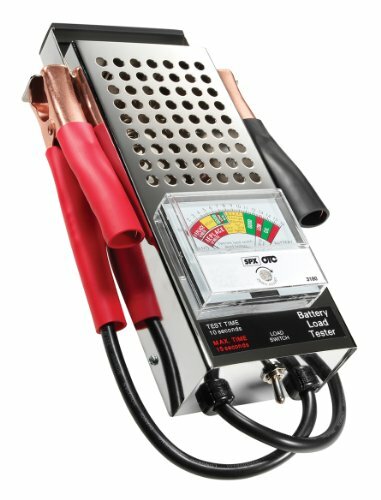 With an operating range of 40 through to 2000 cold cranking amps, this tester is adequate for even the largest of batteries. Furthermore, it doesn’t matter what type of battery you have in your vehicle. It easily switches between testing AGM flat plate, standard acid, gel cell, and spiral wound batteries. The display is large and easy to read. A blue-backlit screen provides clear data, whether in dark or brightly-illuminated environments. What’s more, contrast can be adjusted to provide the perfect resolution. This is a useful feature if the unit is to be used in a variety of locations. Additionally, testing information is displayed over four separate lines. You don’t have to flick between screens to see all the relevant information. It’s all there at once. It’s constructed from molded plastic, which should help to prevent damage if the tester is dropped. The cables are 10 feet long, allowing you to access even the hardest to reach battery terminals. For those who need documentation, an inbuilt printer allows testing data to be produced at the press of a button. As it uses standard thermal paper (cashier rolls), there are no expensive bespoke extras to buy. Additionally, each test is individually recorded, numbered and given a specific tracking code. This is particularly appealing if the tester is to be used in a commercial context. Documentary proof can be provided simply and accurately. A nice feature is the “intelligent” testing system. The user is guided on the screen through each stage of the analytic process. This ensures nothing is missed and the results are as accurate as possible. Large buttons enable the menus to be clicked through easily, even when wearing gloves. Suitable for both six and 12-volt batteries. Easy-to-read backlit adjustable display with four lines of information. Printing facility providing testing documentation. “Walk-through” testing by following on-screen instructions. Temperature compensation allowing for more accurate reporting. May have unnecessary features for those wanting a simple tester. A powerful machine that is equally suited for the serious enthusiast or the professional. Wide CCA and voltage range means that virtually all ratings of the battery can be tested and readings recorded through the printer. The only downside is that some features may be “overkill” for basic users. Schumacher has been associated with automotive electrics since 1947. Their innovative products continue with the BT-100 tester. Although at first glance it doesn’t look as versatile as the Solar or Foxwell, the Schumacher tester still delivers. Being able to test six volt and 12-volt batteries (at 50 and 100 amps respectively), this unit is ideal for the modern or vintage car enthusiast. It can test batteries from 100 through to 1000 cold cranking amps, making it suitable for most standard sized cars. It would be insufficient for use on heavy-duty trucks, though. Information is relayed through the large analog needle display face. A clean, white background enables the data to be easily read. Although, if you are visually challenged, much of the text may be too small to read. The casing is made from steel and is shock-resistant. While this should prevent any damage to the internal components if dropped, scratches and dents are a strong possibility. If you don’t mind a “well-used” appearance, this shouldn’t be a negative. Large vent holes in the steel case prevent the tester from overheating. These protect the electrical system, while also providing more accurate battery-health readings. A nice feature is the spring-loaded “on” switch. The tester only works while it is depressed, springing back to the “off” position when released. This prevents the tester overheating—should the user forget that it is still connected. Great if you are somewhat absent minded. The cables are only two feet long, so the unit needs to be located close to the battery terminals. The tester can be held with the attached handle, which is covered in rubber, for both safety and comfort. This machine can be used for load testing, battery health and draw of the starter motor. Therefore, providing a complete diagnosis of the charging system. Large ventilation holes to prevent overheating. Spring-loaded on/off button to prevent accidental prolonged testing. Short cables mean the unit has to be located close to terminals. Small handles on the clamps could be awkward for larger hands. The text is small on display face. A nice unit for those people who aren’t interested in digital readouts and want a more “traditional” tester. A wide range of applications means it is perfect for the home user. But the short cables may be problematic in some circumstances. A robust tester that provides digital battery features in a lower-priced unit. While the digital display on this tester may not provide as much comprehensive information as the Foxwell and Solar models, it still has some nice features. Designed for 12-volt batteries, with a range of 100 to 995 cold cranking amps, it is a nice unit for the home user. Especially those who have no requirement for the extra capabilities of much more expensive machines. The display is clear and backlit. With extra-large LCD digits, it’s easy to read, even for those people whose eyesight isn’t what it used to be. Possibly a good choice for the senior market. Battery health is indicated by a status bar, which extends across the full length of the display. Again, this makes reading the tester simple. A rugged, rubberized casing protects the unit from damage, particularly useful for the more clumsy car enthusiast. Although, the bright yellow coloring and somewhat dated-looking buttons may not appeal if you’re looking for more “techy” aesthetics. Five feet of cable provides a nice balance between comfort and having to store large lengths of lead. For most standard-sized cars, this should enable the unit to be used inside the vehicle. These cables culminate in over-large handled clamps. While this may make them awkward if the battery is in a tight position, it does have some advantages. Their large size provides easy handling and increases leverage when opening. Hence, for the strength challenged among us, they may be a good option. This tester has the capability to check for battery-life percentage, cold cranking amps, current battery voltage, and battery resistance. For people who are concerned about safety when working on their cars, this could be a good choice. It has numerous features to protect the user. This includes prevention of reverse polarity, voltage surges, and “beeps” to remind you it’s still in use. One of the more economical digital battery testers. Large digits make it very simple to read, even from a distance. Large clamp handles make opening the clips easy. Numerous safety features for peace of mind. Basic—may not deliver enough data for the serious user. For a simple machine, the instructions are difficult to read. Appearance—looks more like an LCD gaming console than a serious tester. An ideal machine for those who need a digital tester, but don’t want the larger price and extensive detail of more professional models. With the lightweight unit, massive LCD digits and easy-opening clamps, it could be an option for the senior market. Part of the Bosch brand, OTC is both a manufacturer and supplier of diagnostic equipment for automotives. The 3180 tester is a no-frills, yet highly-accurate, product. One of the most initially striking features of this tester is the extra-large display. Cased in heavy-duty plastic, the needle is clear and easy to see. The printed scales inside the casing are mostly in large text—useful if you struggle with smaller typefaces. A six and 12-volt capacity makes it useful for those with modern cars, or you may be lucky enough to have access to a 6-volt golf buggy. The cables are just less than two feet long, meaning that this may not suit if your battery is not easily accessible. While this product lacks some features that the top models in this list possess, it still provides sufficient diagnostics for the home user. This includes the charge status, charging volts and cranking. Furthermore, a clear indicator illustrates whether the battery is “bad” or “good”. For a basic tester, the build is quite attractive. The heavy-duty steel case is chrome covered, providing a sleek appearance. However, I would suggest that this chrome would not remain so appealing after extensive garage use. Large ventilation holes reduce the possibility of overheating. A safety switch prevents arcing, which could otherwise cause fire or explosions. If this tester is to be used intermittently on just one battery it could suit. However, if numerous batteries are being tested often, it may prove a little disappointing. The 10-second test process is quite long. In addition, it will require a few minutes “cooling-down” time after testing just two batteries. Not ideal for the heavy user. Simple to understand good/bad battery status indicator. Hardened steel chrome casing with large ventilation holes. Not suitable for heavy use—requires a “cooling-off” period. A battery tester that is easy to read and operate. This unit is best suited for light use. It’s ideal for the person who is not interested in detailed diagnostics, but just wants to check their battery is healthy. Simply, without it, that automobile of yours isn’t going to start. The battery provides power to the starter, which in turn kicks the engine into firing up. As you may be aware, it wasn’t always like this. The earliest cars were started with a manual crank. A guy, or girl, would make their way to the front of the car and repeatedly turn a handle until the engine started. Since the Hudson Motor Car Company developed the first standard car battery in 1920, the days of using your servant to start the car are—thankfully—long gone. However, whereas before, you could simply tell that your serf was in good working condition, just looking at your battery gives you no indication of its well-being. Theoretically, you don’t. If your car battery is working, the car will start—if it’s broken it will not. However, that’s similar to saying you woke up this morning and didn’t die during the night—so you must be healthy. Despite the fact you smoke 40 cigarettes a day and dine daily on deep-fried donuts. Using a car battery tester allows you to perform a “health check” on the battery—preventing and solving issues before they occur. Here are some key reasons to use a car battery tester. Sadly, nothing lasts forever—including car batteries. Generally, they’re expected to have a life of around five years. But, depending on various factors, it can be longer or shorter than this. Overcharging, living in a hot climate, draining the battery fully and excess vibration due to untracked wheels can all shorten battery life. Inside the battery are plates which control the current. Through constant use, they age. This means some of the plate material flakes off—reducing the power of the battery. At some point, they will give up altogether. Battery testers can allow you to check how your battery is coping with old age. You know whether to tolerate them for a little longer, or prepare for a funeral. If you turn the ignition and there’s no electrical power, what do you do? Probably the first thing to check is that the battery terminals are connected. If they are, you’re pretty much assured your battery is dead. It’s fairly simple to remove the battery, charge and replace. You turn the ignition and the car starts. Great. So off you go to the supermarket for your shopping, crank up the AC and listen to your tunes. After the groceries have been bought, you load up the car and turn on the ignition—it’s dead again. In this scenario, it’s easy to assume that you need a new battery. But that may not be the case. Problems with the alternator (which charges the battery), a parasitic drain, or a short, could also be the cause. If the car battery tester indicates that the battery is in good form, it’s time to look elsewhere for the issue. Okay, this is pretty rare, but it does occur. Old lead-acid batteries, if damaged, can sometimes explode. Overheating cells can break, creating a domino effect throughout the other cells. This can either lead to a fire or, in extreme cases, an explosion. Checking that your battery is in good condition will prevent movie-like pyrotechnics. Just ensuring that the battery is working correctly is a common sense approach. It alleviates being late for work, missing the school run or becoming stranded in the wilderness. Depending on the particular tester, they can give load tests, check current and voltage and indicate short circuits. Car battery testers range from a basic voltage tester through to a professional grade diagnostic tool. The features you need in a tester depend on your battery type, vehicle size, and personal requirements. Here are the key characteristics you should consider. Most modern cars have 12-volt batteries. Although to be fair, when fully charged, they should read at about 12.6 volts or higher. However, many classic autos up to the mid-1950s ran on six volts. Additionally, cars such as the Volkswagen Beetle and Citroen 2CV kept this smaller voltage until the 1970s. So, if you have a vintage Chevy Bel Air on the drive, you may need to look for a tester with six-volt capacity. Sometimes just referred to as “CAs” or “CCAs,” checking you have the correct cold cranking amp capability is important in selecting your tester. Here’s the technical bit. CCAs refer to the number of amps a battery, at 32 degrees Fahrenheit, delivers for 30 seconds while maintaining 7.2 volts per individual cell. Exciting stuff, right? Simply put, it’s how much power your car needs, to start in cold weather. Hence, while your battery may start in summer, it could fail in winter. This number varies between different models. Therefore, it’s important to check that your battery tester is suitable for your vehicle’s battery. A standard size car battery will have a rating of around 500-700 CCAs. Large trucks can go over 1000 CCAs. Also, it’s worth looking for a tester that allows you to test the load in increasing amp levels. This will provide you with a more accurate reading. Batteries no longer all come in the same format. Some battery testers have the ability to check a wide range of battery types, such as standard, gel cell, and spiral wound. Others are more limited in scope. Choose a display that is as clear to read as possible, otherwise, you could be making an incorrect assessment of your battery’s condition. Also, consider where the tester is to be used. Strip lighting in garages can make some screens and displays unreadable—in which case some backlighting from the unit itself could be beneficial. Battery testers are often balanced in precarious positions while you attach the clamps or contacts to the terminals. In these circumstances, they could fall to the floor and become damaged. Ideally, look for testers with a sturdy construction that will not break the first time they hit the ground. Longer cables provide versatility and enable you to locate the unit safely, as referred to above. Additionally, car batteries can often be placed in awkward positions—long cables enable you to easily reach the terminals. Also, if you are doing a “start test”, i.e. testing the power of the battery during ignition, long cables allow you to have the unit inside the vehicle. For either the professional or serious enthusiast. Some testers can create printed reports of the test results. This can provide an accurate record of your tests—a useful feature for monitoring how your battery is performing over time. This can document clearly when your battery begins its slow decline. If you’re looking for a safe, reliable and accurate car battery tester—all the above products fit these qualities. 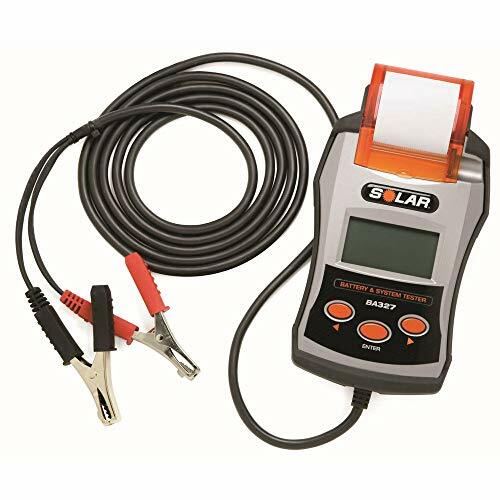 However, when it comes to the best, my personal tester of choice has to be the Solar BA327 Electronic Battery and System Tester. This is a machine with serious diagnostic properties. Providing information on battery health, status, voltage, load capacity, and start-up testing—there is little more information you require. This makes it an ideal machine for both the professional user and the serious home enthusiast. However, this attention to diagnostic data does not mean the unit is complicated to operate. The user is guided through the process by the digital display, ensuring accurate results. Furthermore, the inbuilt printer means documentation or frequent battery monitoring is easy.I hope that this article has helped you. Using a car battery tester will mean those battery failures are a thing of the past. You can sleep easy, knowing the next morning your car is roaring to go—not dead on its wheels. I have been using the Foxwell BT 705 for well over a year now, on a variety of vehicles, and I can attest that it is a very reliable and robust product. It is easy to use, and the screen directions are intuitive. The extra long cables are really useful when you want to start the vehicle to carry out further diagnostics other than just the state of the battery. They enable you to be able to hold the unit n your hand while starting the vehicle from the driving seat. Add to this the option of adding a bluetooth printer and you have a very capable tool in your hands for not a lot of cash.